This vitamin rich hydrating mist provides moisture and soothing botanicals to over-stressed and dry skin. This product contains a select blend of anti-inflammatory and healing ingredients that fight damage caused by over drying and the environment. Ideal for mature and normal skin types. *To purchase product please register for a licensed professional account. 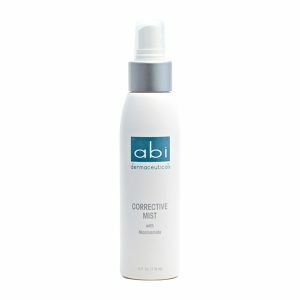 This efficient blemish spray hydrates and soothes as it alleviates congested skin. This powerful formula with Niacinamide, a known antioxidant and anti-inflammatory agent, and Sodium PCA, a high performance humectant, help to hydrate the skin while diminishing blemishes. Ideal for oily and acne prone skin types. © 2019 - ABI Skin Care. All rights reserved.